Meet the Pozo de la Salud on the island of El Hierro. 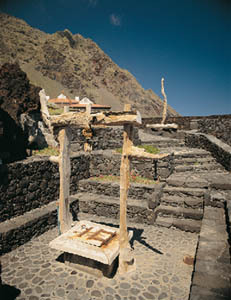 Pozo de la Salud is located in the municipality of La Frontera close to Sabinosa, on the small island of El Hierro. The Pozo de la Salud is, without any doubt, one of the most visited tourist enclaves on this island. On 1830 it was confirmed that the waters from this well have curative properties, specially for illnesses related with the digestive and circulatory system. Nowadays it has been converted into a modern spa managed by the Cabildo de El Hierro, which also offers diverse healing treatments. Pozo de La Salud, La Frontera, El Hierro.